Steve Fishman: Spitzer’s Finally Fighting Back, But Is He Eliot Reagan?Governor Spitzer finally abandoned his silly business-as-usual tactic today, giving up the “I’m going to get back to doing the people’s business” that invariably means something is amiss. The Republican-led State Senate had suggested that it might act like a real legislative body, one with oversight responsibilities and subpoena powers, and investigate whether the governor knew that a top aide was tracking Senate leader Joe Bruno’s use of state vehicles. And Spitzer finally broke his silence on the burgeoning scandal to warn the senator that, in effect, the senators shouldn’t punch above their weight. Never one to be outlawyered, the governor has apparently been reading up on the state constitution, and he charged in a statement that New York’s Senate does not have the constitutional authority to investigate the executive branch. In other words, he seemed to say that he won’t cooperate with any investigation and will instead invoke an Empire State version executive privilege. Whether the potential drama of a constitutional showdown will, in fact, entice the Republican Senate remains to be seen. Steamroller Stalled: Could You See It Coming?In a nutshell: In an effort to score political points by claiming his nemesis, Joe Bruno, was inappropriately using state resources (aircraft, cars, troopers) to travel to political events, Eliot Spitzer, or at least people working for Eliot Spitzer, inappropriately used state resources (the state police) to carry out their oppo research. A.G. Andrew Cuomo released a report yesterday saying so, and saying, incidentally, that Bruno hadn’t actually done anything wrong. Spitzer indefinitely suspended one aide, transferred another out of the governor’s office, and denied any knowledge of what they were up to; Republicans are skeptical he was really so oblivious. So much for being the White Knight, eh? 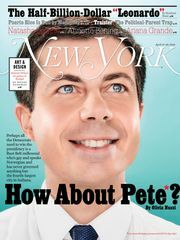 In last week’s New York, Steve Fishman profiled the governor and examined his (many) feuds with other state officials, most notably Bruno. There’s lots of fun foreshadowing.